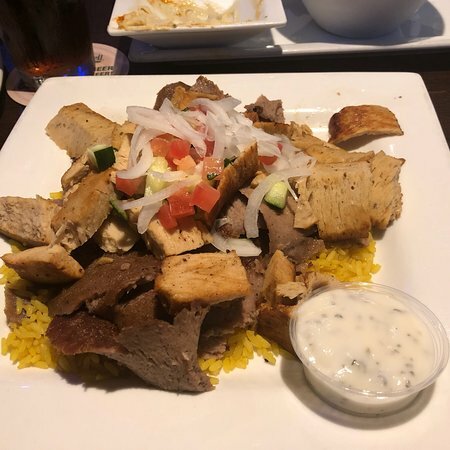 The Greek rice is delicious as are the...We get falafel, Gyros plate , and many other items.... hummus, pita bread, olives, feta, etc Ordered a Falafel wrap which was good! We enjoyed Ansari's on Christmas Eve. 12" flatbread‏ pizza cut into strips with homemade lemon garlic sauce topped with mozzarella and served with marinara. roasted eggplant dip ground with garlic, tahini sauce, lemon juice and spices. 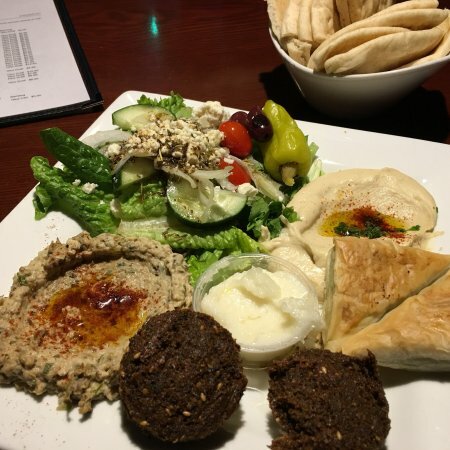 a generous‏ portion of hummus, spinach pie, falafel, gyros, kibbeh, and greek salad. 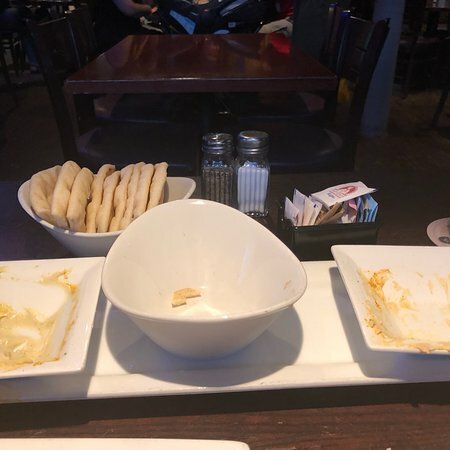 chickpeas pureed with tahini sauce, garlic and lemon juice, served with pita bread. spicy includes red peppers. red lentils, carrots and onions in chicken broth. cracked wheat with finely chopped parsley, mint, tomato, cucumber and onion on crispy romaine with lemon and olive oil. 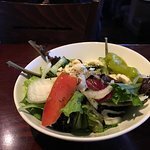 mixed greens, tomato, cucumber, onion, olives, pepperoncini and feta with lemon, olive oil and garlic dressing. fresh salad greens tossed in tzatziki with a scoop of hummus, falafel, and gyros. topped with cucumber, kalamata olives, pepperoncini, tomato and onion. fresh romaine lettuce with caesar dressing, croutons and parmesan. 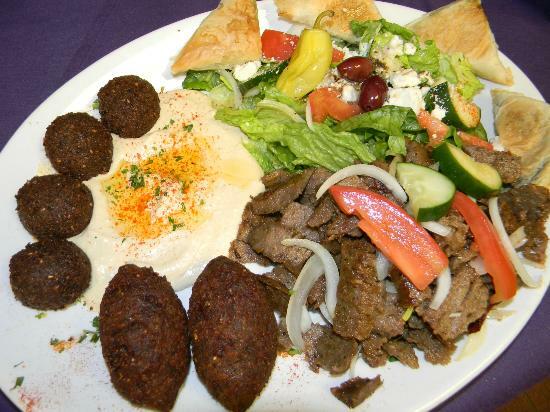 choice of tender beef, lamb, chicken, kufta, veggie or shrimp cooked to perfection with onion, tomato, green pepper and mushrooms. served with rice, greek potatoes or fries. 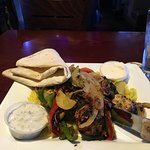 choice of‏ beef, chicken, shrimp, gyros or vegetarian sauteed in tasty teriyaki sauce with onions, mushrooms, bell peppers, squash and zucchini, served with rice. available spicy or mild. 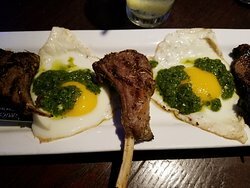 half rack of lamb, two eggs sunny side up topped with jalapeno cilantro glaze. served with greek potatoes. three ground‏ lamb patties topped with caramelized onions and roasted garlic boursin cheese, served with a salad or soup. our 3 favorite shrimp - coconut, garlic, and crispy - served with sauteed vegetables and choice of couscous or rice. best of both worlds! 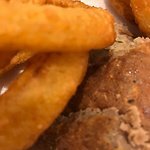 sliced chicken gyro and seasoned lamb/beef gyros sauteed with onions, served in choice of bread. choice of personal pita 6" or flatbread pizza 10", 12" and 14"
choice of sauce, toppings and our 5-cheese blend or mozzarella cheese. house red sauce topped with a 5-cheese blend of mozzarella, provolone, romano, parmesan and cheddar cheeses. house red sauce topped with beef pepperoni and our 5-cheese blend. olive oil, hummus, minced garlic, garlic chicken, kalamata olives, spinach, feta and mozzarella cheese. a tzatziki spread with gyros, omons and mozzarella cheese. house red sauce, cilantro, fresh jalapenos, shrimp, onions and our 5 cheese blend. this pizza is our local favorite, it's so good! tzatziki spread, crushed red pepper, green peppers, red peppers, onions, feta, five-cheese blend, pepperoni and gyros. choice of sauce with hummus, olive oil, spicy feta, lemon garlic or pesto, topped with green peppers, spinach, tomatoes, onions, mushrooms and mozzarella cheese. a creamy alfredo base sauce topped with garlic chicken, mushrooms and mozzarella cheese. angel hair pasta tossed with olive oil, pine nuts, feta cheese and spices. creamy white alfredo sauce served over fettuccini. cavatappi pasta, kalamata olives, roasted red peppers and feta cheese in a garlic butter sauce. chicken and‏ fresh tomatoes with a mild or spicy pesto cream sauce over fettuccini. 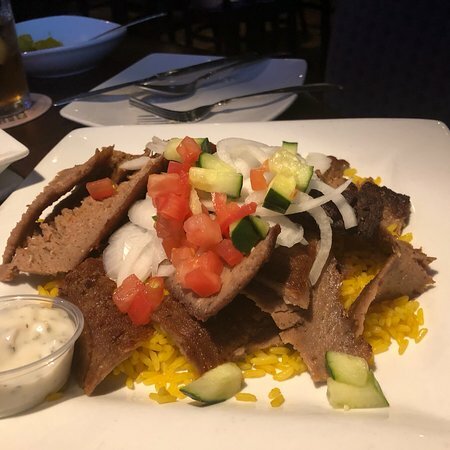 Authentic Mediterranean cuisine with a warm family friendly environment. Full service bar with specialty drinks. Featuring Belly Dancing on Thursday, Friday and Saturday nights, Live music follows. Mediterranean food specially Greek. Bingo and Belly dancer nights are a must. 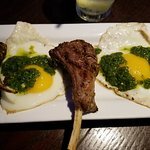 Atmosphere is very good and service is fast. It’s one of those places where you going to find locals. Came in on a Wednesday night. They had bingo going on and it was a lot of fun. The meat lovers pizza was fantastic. Great thin crust. Great night. Revisited Ansari’s after a long absence as we had a craving for some Greek food. 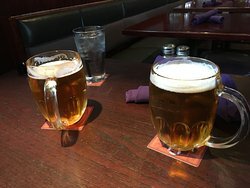 The Dolmas were very good and the Happy Hour specials were very inexpensive. Get quick answers from Ansari's Mediterranean Grill & Lounge staff and past visitors.